Operating - Blue, Charging - Red, Fully Charged – Green. A Bioelectrical Impedance Analysis (BIA) will be conducted via the four electrode sensors to determine your skeletal muscle mass, body fat percentage, and other components of your body composition. Your activity levels can be gauged via the acceleration sensors built into the device. Turn the device on or off with a simple press of the power button. The LED display is activated when the device is in use. Download and run ONE SMARTDIET App from Google Play Store or Apple App Store. Turn on the device and select the Measure button in the App. Lightly pinch 4 electrodes with both of your thumbs and index finger. Stretch your arms and avoid your hand to touch each other, also do not talk while you are measuring. From the ONE SMARTDIET App you may check the measurment result and analysis from many different menus. ONE SMARTDIET App is constantly updated and maintained. If you turn on the device, it will be connected with your smartphone. If you hold the device for 5 seconds, it will be scanned the upper side of your body. ONE SMARTDIET application shows the standard range as your basic information. Your data is recorded in the application so you can check the history. You can check how many walk and burned calories. ONE SMARTDIET app analyzes the user's body type and guides how to exercise and what foods to eat. 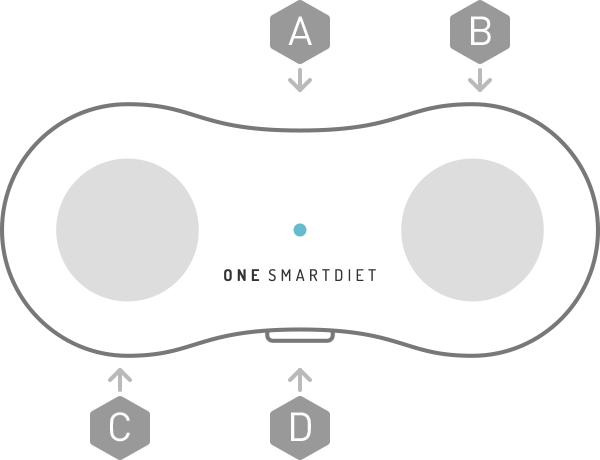 ONE SMARTDIET syncs with your smartphone. Make sure your Bluetooth is on. ONE SMARTDIET App is compatible with Android version 4.4, iOS version 9.0 and above. It may not be supported on an Android tablet or iPad. A PIN number is not required to access the ONE SMARTDIET App on your smartphone. ONE SMARTDIET is not a medical device and should not be used for diagnostics or treatment. Do not use ONE SMARTDIET to measure your body composition during pregnancy or menstruation. There will be discrepancies. Make sure to remove any nearby devices that can cause wireless interference. These sources include but are not limited to microwave ovens, wireless audio operating in the 2.4 GHz or 5 GHz bandwidth, and certain power sources. These sources can cause slower performance or disconnection from ONE SMARTDIET and may also interfere with the Bioelectrical Impedance Analysis, resulting in inaccurate readings.